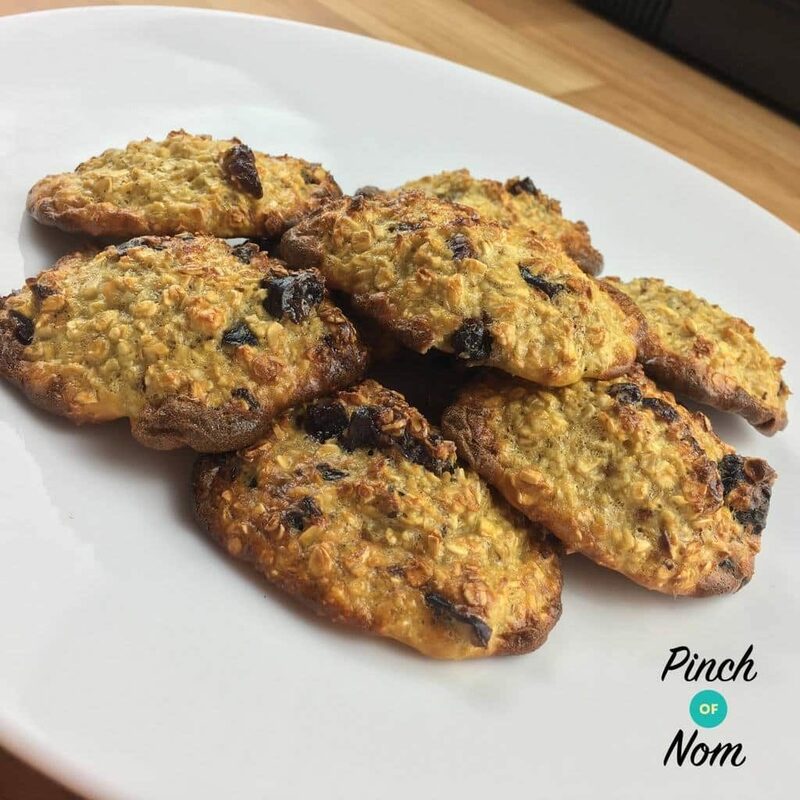 You make these Low Syn Cranberry and Almond Oat Cookies using 2 Healthy Extra B options, which means you can have 5 cookies today and save 5 for tomorrow. Or if you’re on an SP day you could eat all of them! Or you could just halve the ingredients to use 1 HEB. If you don’t want to use your HEB 5 cookies will cost you 6 syns plus 2 syns for the cranberries. To make a crispier cookie you can flatten them down more when you place them on the baking tray, but keep an eye on them so they don’t burn. With only 6 ingredients this is a super easy recipe, and can be whipped up in minutes. You can find Almond Extract in most supermarkets or here at Amazon . 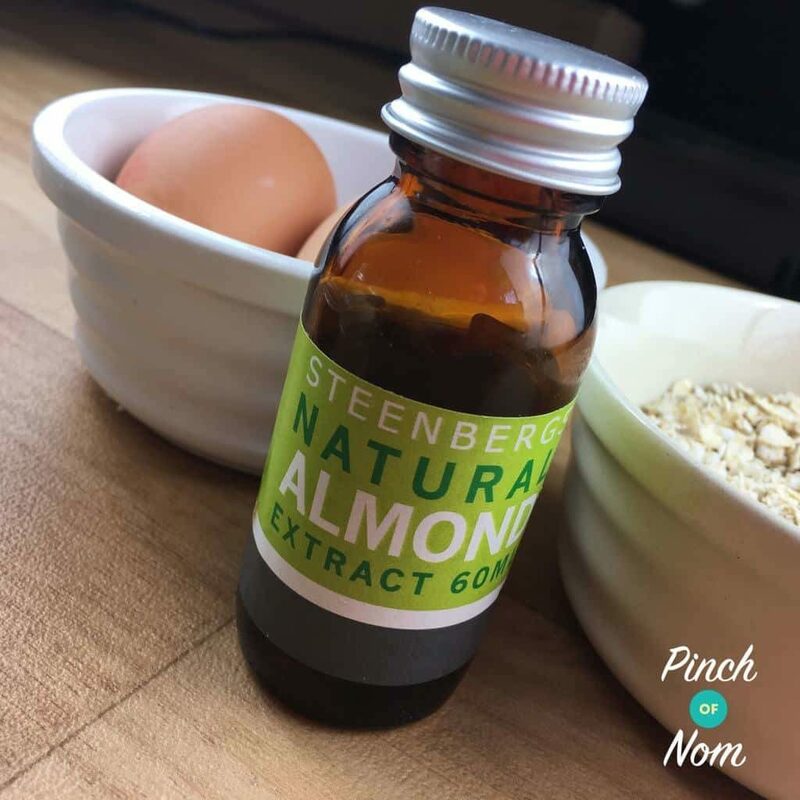 You can use almond essence, but we prefer to use extract. Essences or flavourings are a chemically developed flavouring and can often give a synthetic taste to your baking. Extracts are flavours ‘extracted’ straight from the source, for example vanilla extract would be taken from the vanilla bean, capturing the delicious and distinctive, rich flavour. We use Sukrin Gold which is an all-natural granulated stevia sweetener alternative to sugar with zero calories. You can grab Sukrin Gold over on Amazon UK. Sukrin Gold doesn’t have that strange after taste that a lot of artificial sweeteners do! It also shares the exact same sweetness and weight to sugar – which makes it really easy to substitute in recipes like these Low Syn Cranberry and Almond Oat Cookies. Should I Syn the sweetener in these Low Syn Cranberry and Almond Oat Cookies? The recipe for these Low Syn Cranberry and Almond Oat Cookies uses 1 tablespoon of sweetener and is divided into 2 portions. That’s half a tablespoon per portion, so there’s no need to add any syns on for the sweetener itself. Hi Helen, can you substitute the cranberry for any other fruits? would it have to be a dried fruit if I did? You can substitute any fruit you like, it doesn’t have to be dried fruit, perhaps raspberries or blueberries? You’ll just need to alter the Syn values accordingly. Can I use an alternative to quark? Hope you enjoyed them, Hazel! So glad you enjoyed them, Hazel! Just tried these but it was a really stodgy mixture & I only got 6 out of the mixture? Where did I go wrong? Followed the recipe but wasn’t sure if I was sposed to spread the mixture out on the baking paper or leave in balls or if the mixture was sposed to be more gooey! I used ready brek oats? Ready Brek has only recently been added as an HEB choice, so these have only been tested with oats. Ready Brek tends to be more absorbent than oats, so will soak up more liquid. You could add some water or possibly an extra egg to loosen the mixture. These sound lovely, are they 2syns and your HEB or either? All info is in the recipe blurb! 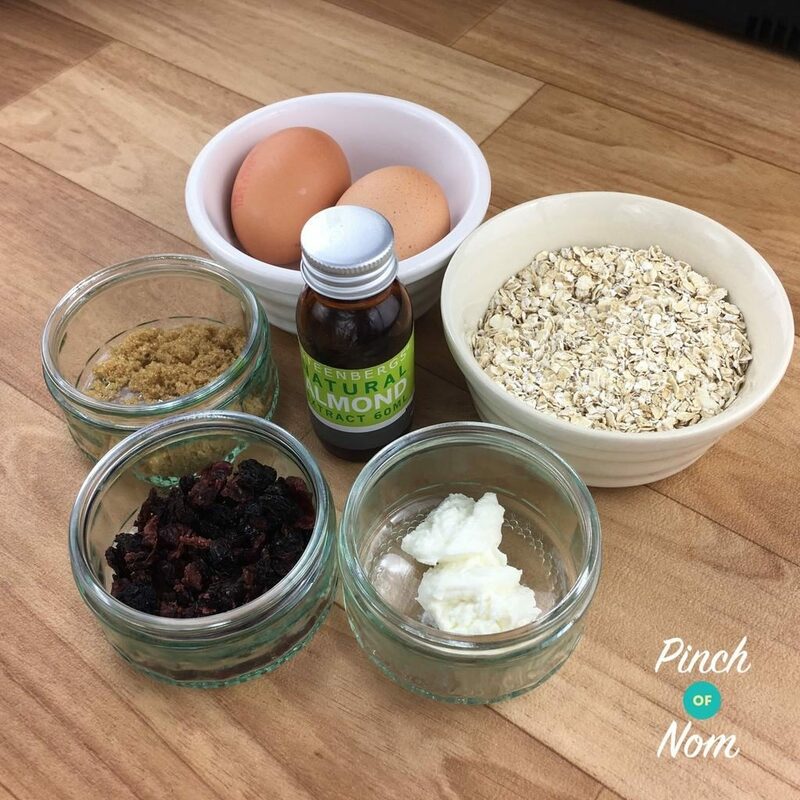 “You make these Low Syn Cranberry and Almond Oat Cookies using 2 Healthy Extra B options, which means you can have 5 cookies today and save 5 for tomorrow. Or if you’re on an SP day you could eat all of them! You could just halve the ingredients to use 1 HEB. Could you use fresh cranberries instead of dried ? Dried fruit tends to be much sweeter, as the natural sweetness in the fruit is concentrated during the drying process. Fresh cranberries tend to be particularly sour, so they may not taste as good for this recipe. You could certainly try, but you’ll need to check the Syn value for cooking fresh cranberries. Hey there, how long can these be kept for? They’ll keep for a few days in an airtight container!